A debut album this powerful doesn't come along very often, probably even less often from a folkie like Arkansas-resident Mike Blackwell. But Come Back To Me hits all the right notes. Much of the credit probably should go to producer Emily Kaitz, who seemed to know the perfect treatment for each song, but the melodies that Blackwell created certainly made Kaitz's job that much easier. I have to admit that I am not great about remembering a tune after only listening to it a couple times, but I could easily sing eight of the twelve songs on this album by only looking at the lyric sheet — I know because I tried it — and that's some kind of record. Come Back To Me starts with a cool road song, "Glacier," which allows us to have some hope for our hero. Don't get too happy, though, because just about all the rest of the songs come uncompromisingly from a darker place lyrically, dealing with loss or tragedy. There is an absolutely heartrending moment in "Oh Louisiana," which is about the ravages of Katrina, that sealed the deal for my love of this album. 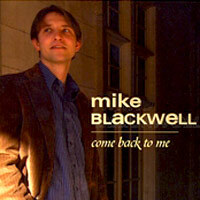 "Felix The Cat" and "Disappeared" are the best songs on Come Back To Me, with "Felix" showcasing Blackwell's Dylanesque vocal style and both songs featuring absolutely amazing harmony vocals from University of Arkansas opera student Ember Lanuti. Suggestions from your silence let me know that you're upset. You seem to understand my feelings, even if my own mind I don't get. The last phrase of that second line was written to force the rhyme. While I understand what Blackwell is trying to say, he's phrased it awkwardly, and I wish he'd come up with a better way to get his point across. Having picked that nit, then, I would like to make it perfectly clear that despite some blemishes, the songwriting here is first-rate: from the heart, poetic, originally stated. But now I won't be around; I won't make no sound. No cries, no cries, no tears. I just won't be here. I just won't be here. Guest artists on Come Back To Me include Keith Grimwood of Trout Fishing in America on upright bass, Donna Stjerna of Still on the Hill on fiddle, and others who round out the sound on mandolin, banjo, congas, pedal steel guitar and more. With Come Back To Me Mike Blackwell and producer Emily Kaitz have created a stirring album of beautiful songs that will break your heart and give you hope at the same time. Don't let it pass you by.